(Even More) Eye Opening than the picture is the camera that took it. Stylus 770 SW – the waterproof, shockproof, crushproof and freezeproof digital point & shoot. Now there’s a camera that goes where you go, so you’re free to Capture It All. Even More Eye Opening than the picture is the camera that took it. e-510 is the first conumer D-SLR with Live View that lets you keep your eye on the action, not on a viewfinder. 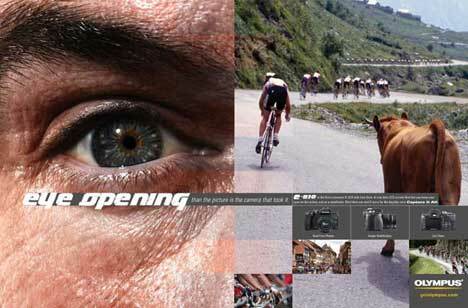 Next time you visit France for the big bike race Capture it All. 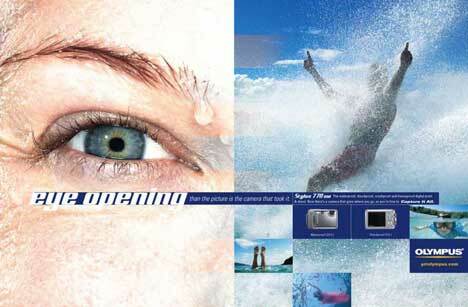 The Olympus ‘Capture It All’ campaign was launched in May 2007 and will run through to August in Time, Backpacker, Men’s Health, Travel + Leisure, Newsweek and Popular Photography. Online ads can be found on Away.com, Backpacker.com, SI.com, Aol.com, NationalGeographic.com, and Wired.com. The ‘Capture It All’ print campaign was developed at Deutsch New York by chief creative officer Peter Nicholson, group creative director David Graham, art director Eric Rojas and copywriter Michael Leibowitz. Photographers were Kenji Tomo (cameras) and Brad Harris (eyes).